LOS ANGELES — Snap Inc., the parent company of red-hot communications app Snapchat, filed public regulatory documents for a hotly anticipated $25 billion IPO Thursday, a sign of the Snapchat parent's maturity and a break in what's been a lackluster market for tech IPOs. Snap (ticker: SNAP on NYSE) looks to raise $3 billion, and says it has 158 million daily users, on average. Some 2.5 billion "Snaps," or photos or videos from within the Snapchat app, are created daily, and 60% of Snap users create daily Snaps, the company says. In the papers, Snap also gave some hard numbers for its business. Since starting operations in 2011, Snap has lost $1.2 billion, and $514.6 million in 2016. The company reported revenue of $404.5 million for 2016, up from $58 million in 2015. Some 1,800 employees now work at Snap. 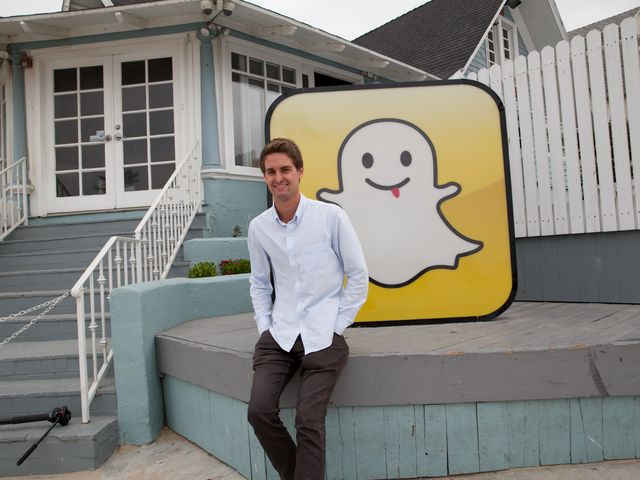 Co-founders Evan Spiegel and Bobby Murphy both have 21.8% of the Snapchat shares. Spiegel was paid $2.4 million in 2016. Here's what you need to know and what else to find in Snap's S-1. Snap, formed in a Stanford University dorm room in 2011, is widely popular with young adults, ages 18-24. That group came to Snapchat 20 times monthly, spending 30 minutes per visit, while users 25 and up came 12 times monthly, spending 20 minutes. The Venice, Calif. company began as a way to share photos and videos that disappeared within 10 seconds, and has morphed into a communications platform for young people to discover video content from the likes of Cosmopolitan, Tastemade and CNN, watch curated news based on video submissions, and create "Stories" of their day, based on a string of photos and videos. Snapchat has recently dived into original programming, with a fast-paced recap/commentary series based on ABC's "The Bachelor," and it now calls itself a "camera company," thanks to its new product, Spectacles, $129 video glasses that are sold in bright yellow vending machines. The Snapchat IPO is expected to be the second biggest U.S. tech IPO ever, after Facebook in 2012, when it was valued at $81.2 billion, according to Renaissance Capital. It's coming at a time when tech IPOs are few and far between, and its performance could be the first of the big "unicorn" start-ups — that is, venture-backed companies worth over $1 billion — to test the public markets this year. It will make a more household name of the company and its CEO as the 26-year-old visits investment firms and Wall Street, and eventually rings the bell for the stock's debut. As a private company, Snapchat hadn't revealed much about its financials. That starts to change with the initial filing. One revelation: User growth is slowing as its overall users expand. In the fourth quarter of 2016, average daily active users slowed to 48% growth year over year, from 62% in the prior quarter and 65% in the second quarter. Research firm eMarketer says Snapchat is expected to generate $935.5 million in worldwide ad revenue this year, up 155% over 2016, and that most of it comes from the United States. Doug Clinton, an analyst with Loop Ventures, says it took nine quarters for Snapchat to grow to 150 million users, compared to six quarters for Instagram and four quarters for Facebook. “Although neither picture-based platform is growing as fast as Facebook did in its heyday, we saw that teens already value Snapchat and Instagram over the older, text-based platforms of Twitter and Facebook,” he said in a note to investors. Snapchat’s lead over Instagram, in time spent in the app per Android user, has declined in the U.S., according to App Annie metrics reported by BuzzFeed. Snapchat had more time spent per user worldwide in early 2016, but by December, Instagram had taken a 25% lead. Facebook-owned Instagram currently has 400 million daily active users to 1.2 billion daily users for Facebook. Social network Twitter filed for an IPO in 2013 that didn’t turn out to be a success for investors, mostly because the network itself hasn’t grown substantially since. The company was valued at $18 billion when the IPO launched in 2013; today it's down to $12.2 billion. Facebook filed an IPO in 2012 that valued the company at over $80 billion, when it had 845 million daily active users. It has a market value of about $385 billion today. There's some disagreement on whether Snap will emulate Facebook, whose double digit growth rate continues to wow investors, or the struggling Twitter. But writing for Zack's Investment Research, Madeleine Johnson says Snap has modeled itself as "a company for the digital age and technology-grounded economy," and she expects big things. "Snapchat’s primary demographic, smart advertising strategy, and ephemeral business model makes the company quite the IPO catch."